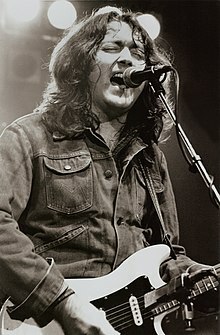 Rory Gallagher, 10-11-87 Vredenburg in Utrecht, Holland. 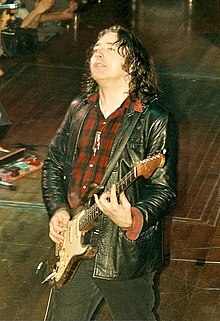 Giotáraí Éireannach a rugadh i mBéal Átha Seanaidh, Contae Dhún na nGall ab ea Rory Gallagher, (2 Márta, 1948 - 14 Meitheamh, 1995). Rugadh Rory i dTír Chonaill, ach d'aistrigh an teaghlach go cathair Doire (i nDoire a saolaíodh a dheartháir Dónal) agus ansin go cathair Chorcaí. Mar sin, tógadh i gCorcaigh é.
Meastar gurbh é Rory an giotáraí Éireannach ba thábhachtaí riamh, agus bhí tionchar mór aige ar ghiotáraithe eile.[fíoras?] Ceoltóir paiseanta ba ea Rory, agus bhí an-cháil ar a chuid taispeántas beo i gceolchoirmeacha fada diana. Fuair Rory bás i Londain sa bhliain 1995. Alcólach déanta ba ea é Tharla coilíniú baictéarach ar a ae. Is féidir le hionfhabhtuithe tinnis áirithe a dhéanamh níos measa agus tháinig ionfhabhtú stafalacocais (MRSA) air. Tá Rory curtha i Reilig Naomh Oilibhéir gar do Bhaile an Chollaigh, ar imeall Chathair Chorcaí. Tugadh an leathanach seo cothrom le dáta an 31 Nollaig 2017 ag 10:15.